This article will guide you through the Freshdesk integration process step by step. Watch the video below or read the instructions that follow, and you’ll connect your Freshdesk account with ChannelReply in no time. Notes: Click on any image to see the full-sized screenshot. Article last updated 1/11/2019; video last updated 7/6/2017. Click “Sign In” to sign in to your ChannelReply account. If you don’t yet have an account, click “Start Free 14-Day Trial” to try out the software—no payment info required! Next, you'll need to sign in to Freshdesk. Make sure the agent account you use has no restrictions on viewing or replying to tickets. You will have a chance to enter your basic user information, but you can skip this for now if you want. 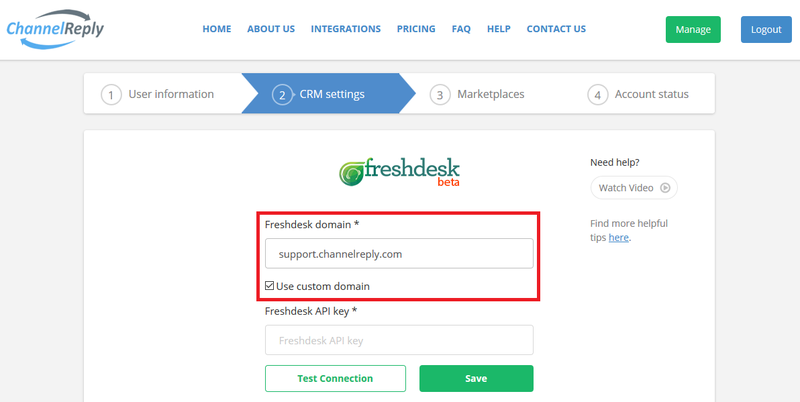 Click “CRM settings” and choose Freshdesk as your service desk. To connect your Freshdesk account to ChannelReply, we’ll need some details from your account, starting with your Freshdesk domain or custom support domain. Your Freshdesk domain can be found between https:// and .freshdesk.com in your Freshdesk support URL. 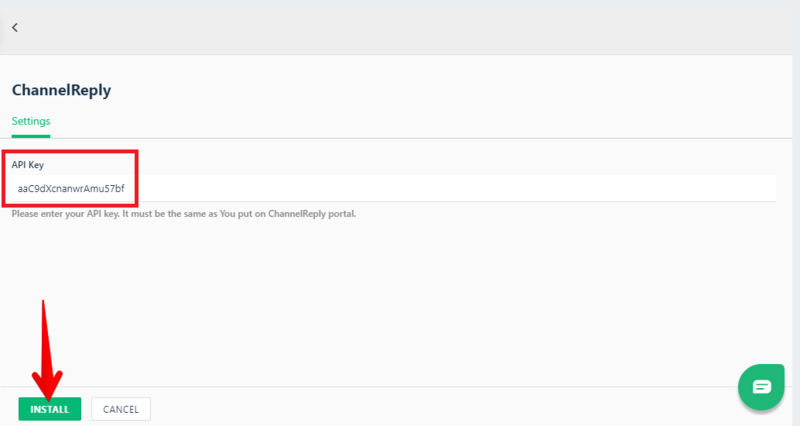 In the example shown below, "channelreply" is the Freshdesk domain. Therefore, "channelreply" is all we'd enter. 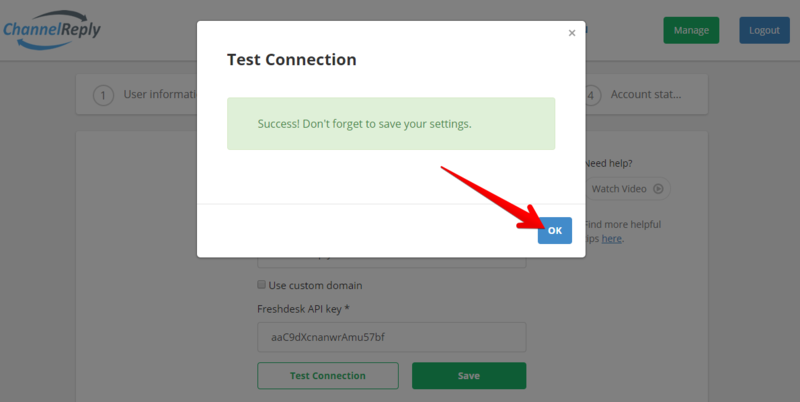 If you have your support portal set up under your own domain name (without freshdesk.com in the URL), check off the “Use custom domain” box and enter your domain instead. When using a custom domain, be sure to include any subdomains and the TLD, such as .com. Next up is entering your Freshdesk API key. From your Freshdesk admin page, you can find this by clicking on your profile picture in the upper right and selecting “Profile settings” from the drop-down menu. You will find your API key in the lower right. Copy it before returning to ChannelReply. A success notification should pop up. Click “OK” to close it. If you see another straightforward success notification, just click “OK” to close this one too. If you have required custom fields set up in Freshdesk, then you will need to enter the default values for your required fields. Click “Save” once all fields are filled in. 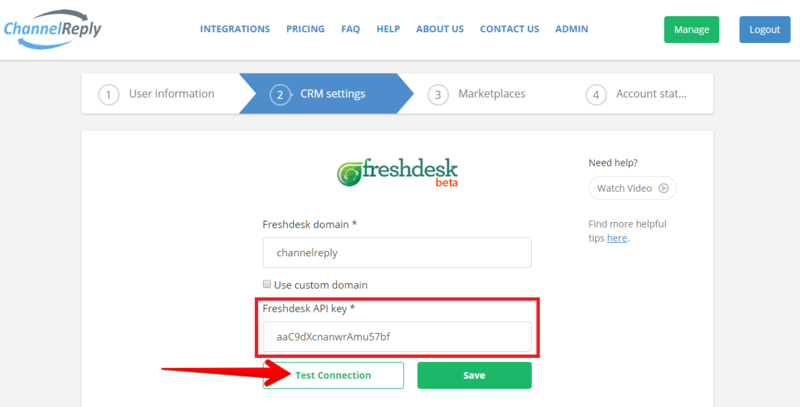 Return to Freshdesk and copy your API key again if necessary. Choose ChannelReply from the E-Commerce section or use the search feature to jump straight to it. Click “Install” on the ChannelReply app page. On the next page, paste in your API key and then click the new “Install” button. 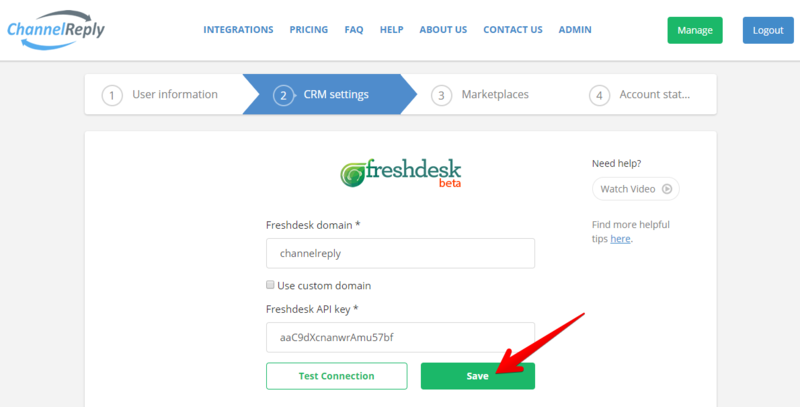 Freshdesk integration is now complete! You should now see ChannelReply on your list of installed apps, plus a success notification. ChannelReply's custom fields allow you to do all kinds of awesome stuff in Freshdesk. For example, you can auto-enter eBay and Amazon data in your canned responses, and set up Dispatch'r rules (triggers) based on order details. Setting them up is entirely optional, and you can skip it now and do it later if you want. Ready to tackle it now? Visit "How to Use ChannelReply Data in Freshdesk Canned Responses & More" for instructions. Congratulations on integrating Freshdesk with ChannelReply! 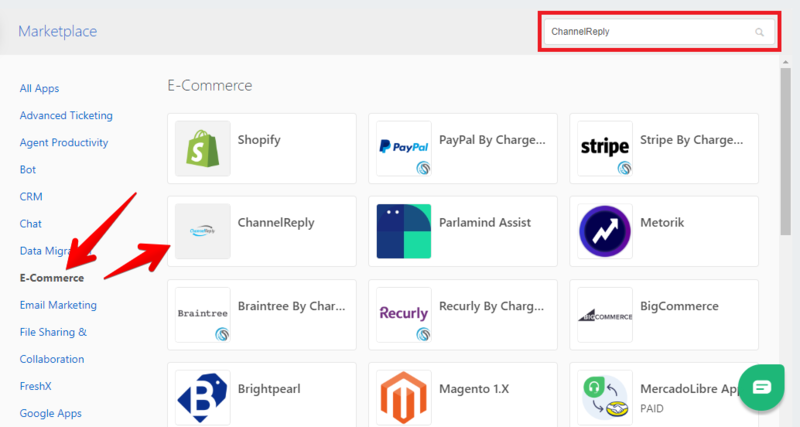 See our instructions on Amazon integration and/or eBay integration to finish ChannelReply setup and start managing your marketplace messages on a single screen. If you ever need help, please contact us and we’ll happily assist you.